Melania Trump has not been seen in public for more than twenty days. This is probably at least partly attributable to the kidney surgery she underwent a few weeks ago, but apparently this is a big deal and Twitter is on it. Maybe Donald Trump beat her! Maybe she's testifying for the feds! It just occurred to me. 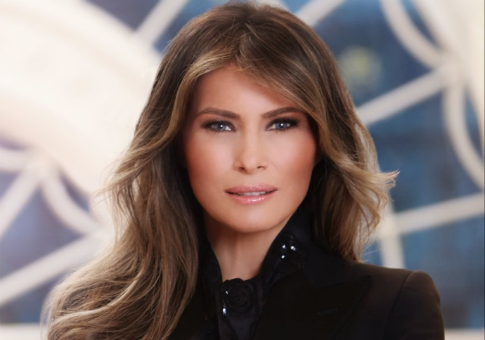 What if Melania has turned witness for Mueller? Maybe Melania is divorcing Donald Trump in a ploy to distract from his crimes! If Manafort flipped, Trump and Krew would be smart to stage a Melania divorce just for diversion. All of the above speculation came after pretty solid reporting that Melania Trump is up and about, courtesy of a Saturday tweet from CNBC reporter Eamon Javers. He added in a later tweet that NBC's Kristen Welker also saw Melania in the White House. The first lady is likewise slated to attend a private Monday event hosting Gold Star families at the White House. So there's no question of Melania being dead or abused or ill or bed-ridden as conspiracy theorists claim. The only question is why she hasn't made any public appearances. Maybe I'm alone in this sentiment, but if I had it my way the First Lady would make no public appearances for the next two years. That's not personal, I just despise the entire existence of the office. It's monarchical, it's dated, it's elitist, it's pointless, and it's a waste of federal funds and staff power. Melania Trump—an intelligent woman who speaks several languages—deserves better than to stand next to her husband silently for four years in what Michelle Obama once humorously called "a really nice prison." It would be different if Melania was a Hillary Clinton-type eager to take on and advise her husband on public policy. There's been no reporting that's the case. So we're left with the fact that a woman with no real powers and no real duties isn't appearing in public, and no real reason why we should care. That didn't stop CNN, MSNBC, Politico, The Washington Post, NBC News and countless others from posting stories on Melania Watch. It was CNN host and media reporter Brian Stelter who tried the hardest to present a coherent defense of his coverage in his most recent "Reliable Sources" newsletter. "Lemme fend off some of the criticism I've already seen on social media: No, this is probably not the most ‘important' story involving the Trumps right now," he wrote. "But it's a ‘talker' in a way that policy debates and ethics scandals and abuse of power allegations are typically not. People are genuinely curious about this and concerned about her…"
I don't see how this is different from Trump's frequent intonations that "people are saying" something, a cop-out to spread his favorite conspiracy theories. Pizzagate was a "talker." Birtherism was a "talker." People are "talking" about any number of dumb stories on a given day because there are millions of people on social media and many of them are quite gullible. When the media chooses to highlight one of them without aiming to debunk the conspiracies, it carries a tacit message that speculation is warranted. And why are people talking about it in the first place? Your average person doesn't track the First Lady's public appearances, reporters do. My sense from watching this story grow and doing a bit of research is that Stelter has it backwards. People didn't begin tweeting about Melania's absence until May 25, the day that The Washington Post first drew attention to it. So it was the media who began to report and tweet that Melania hadn't been seen in public, which sparked public speculation, which led to reporting on the speculation, which led to people sharing those stories and speculating. This is a story the media basically willed into existence. It's a narrative ex nihilo. Stelter also frames this as people being "concerned about her," but what are they concerned about exactly? That Melania's being abused, by Trump? That she's turned state's witness, against Trump? That she's divorcing Trump? That she was murdered, by Trump? Weirdly, all the "concerns" voiced about Melania seem to be a form of attacking the president. Imagine that Michelle Obama was off the grid for a few weeks after a surgery. The White House says she's okay, reporters see her walking around the West Wing. Meanwhile, the Alex Joneses and Mike Cernovichs of the world begin wildly speculating that Obama has beaten her, that she is testifying against him, that she was murdered, etc., etc. etc. Does anyone believe that the media at large would report with a straight-face that, gosh, Michelle hasn't been seen in a while, there sure are a lot of people out there saying that's weird, and hey, we're just asking questions here? Or would they recognize that they would be feeding into irresponsible conspiracy-mongering? I'm inclined to think that if the parties were reversed, the media would be covering the speculation. But they'd do so responsibly, casting it as a case study in the ills of social media and how quickly fake news spreads. But alas, apparently an anti-Trump angle is all it takes to get serious reporters to flirt with unhinged innuendo. This entry was posted in Politics and tagged Brian Stelter, CNN, Melania Trump. Bookmark the permalink.